Missions have always been important to Penelope. PBC has been involved in domestic and international missions including a local mission church in the Blackburn Community. PBC has also been involved with supporting missionaries from Penelope and through giving to the Southern Baptist Convention's missions offerings. Our Mission Team is led by the words of the Apostle Paul in 2 Corinthians 4:5. Paul wrote, "For we do not preach ourselves, but Jesus Christ as Lord, and ourselves as your servants for Jesus' sake." Everything we do on our trips is done to help proclaim the name of Jesus to those who do not know Him personally. Below are our most recent mission trips and information about them. In 2015 our church voted to become a sponsoring church through the North American Mission Board to help plant a church in Baltimore, Maryland. Current statistics show that 90% of the residents of the greater Baltimore area have no church affiliation. We are excited to be working with Phil Gifford as he plants a church in this heavily unchurched area. Our plans include not only financial support but we will also be taking mission trips to Baltimore to assist in planting the church. More details will be coming soon. In June 2013, 8 members of the PBC Mission Team headed to the Central American country of Honduras. They worked through the NC Baptist Men's Partnership with Honduras in the village of Las Cabezas near the city of Choluteca. While there, our team worked to build a house for a great family. Joel & Rita Ordanez, and their family, were wonderful people to work alongside and minister to during our team's stay in Honduras. Our team also offered a VBS during three afternoons for kids from the village. It included a time of singing, a story, coloring pictures and games. The team built great relationships and had a great time ministering to the Honduran people. To the right is a picture of our team of 8, just prior to leaving Honduras. 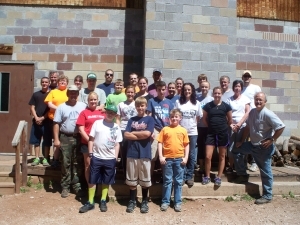 In July 2012 our PBC Mission Team traveled to Casper, WY to work at Mountain Top Baptist Assembly on top of Casper Mountain. We were split into 2 teams. One worked 14 hour days cooking 1,300 meals throughout the week for the campers and workers. The other team cut down 350 trees to clear a 1/2 acre of land for a BB/Archery Shooting Range and to clear a trail into a campsite. Though the trip took 35 hours through 10 states and 2 time zones our team was able to accomplish God-sized results in a short amount of time. It was all thanks to the God we serve. To the right is our team of 28 in front of the dining hall. 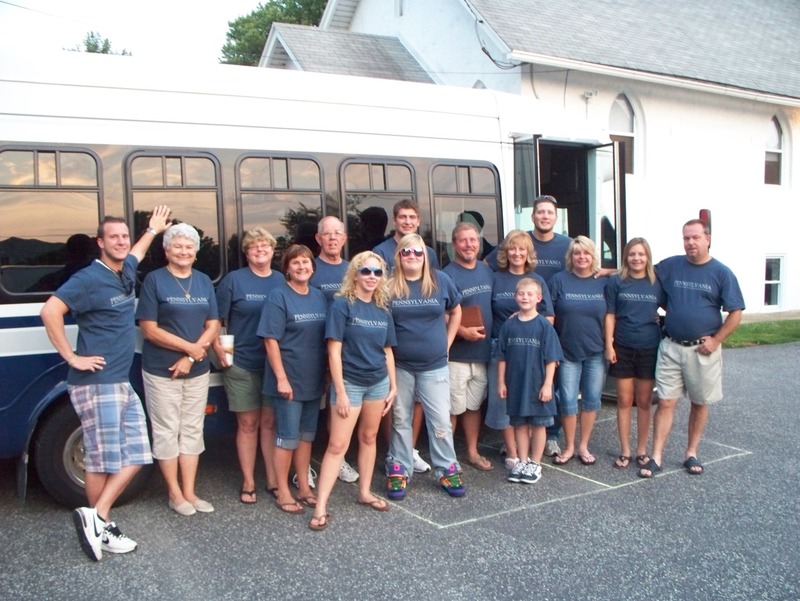 In July 2011 our PBC Mission Team traveled back to Sheffield, Vermont to assist both Sheffield & South Wheelock Baptist Churches again. Our team once again cut, split & stacked 4 cords of firewood for the pastor and his family. The team also painted South Wheelock Baptist Church. Throughout the trip our team was able to see God impact the community, the churches, and even our own team. During our free time we once again played outdoor laser tag, shopped, swam in the hotel pool & played ultimate frisbee. To the right is our team of 26 in front of South Wheelock Baptist Church. 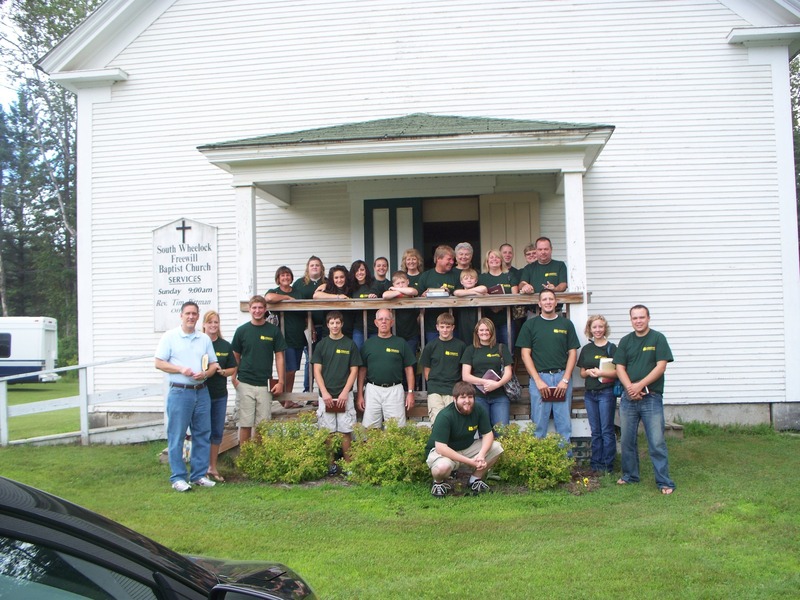 In July 2010 our PBC Mission Team traveled to the Green Mountain State to assist two churches served by the same pastor in Sheffield, Vermont. The team worked at South Wheelock Baptist Church clearing land owned by the church. At Sheffield Baptist Church the team worked cutting, splitting and stacking 7 cords of firewood for the pastor and his family. Our team provided and cooked their meals at Sheffield Baptist Church. During our down time in Vermont team members, among other things, played outdoor laser tag and swam in the pool at the hotel. The picture to the right is our team of 25 in front of South Wheelock Baptist Church. In July 2009 our PBC Mission Team took on the big city of Philadelphia. The team assisted The Foundry Church in Wallingford, PA. While there the team painted the exterior of the church, did several handyman projects at the church & parsonage, and ran a summer day camp at the church for local kids. While there our team provided and cooked their own meals at the church. While on the way to Philly the team took in a stop at Arlington National Cemetery in Washington, D.C. The picture to the right is our team of 16 in front of the church where we worked. 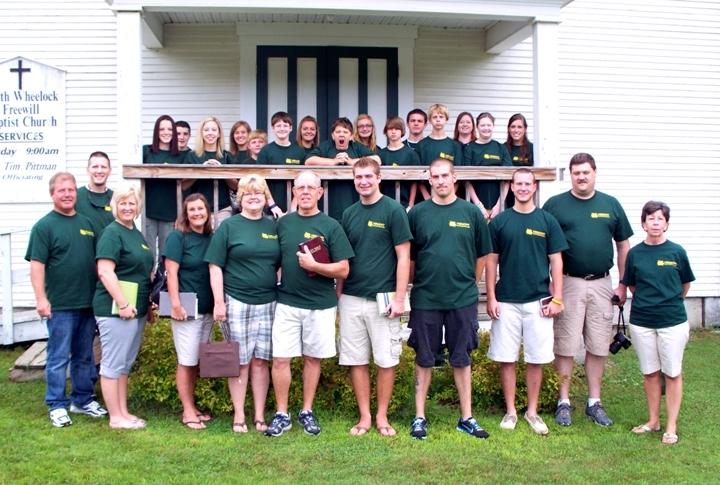 In June 2008 PBC Youth took a mission trip to Halifax, Nova Scotia to assist Gospel Light Baptist Church. On their church property they had many trees that had been blown over due to a hurricane. Our team cleared trees, limbs and debris for 2-1/2 days and filled 7 recycling center bins. Team members stayed in the homes of church members and ate most meals at the church. Stops on the way up and way back included a night at the Rice Lodge in Massachusetts and a visit to the Statue of Liberty in New York City. The picture to the right is our team of 26 just prior to leaving Halifax.